Flat Coated Retrievers are fun-natured, caring, energized dogs that absolutely love to play. When outdoors, this breed can be found scouring the land, running about making a scene, but when its time to relax inside of the home, the Flat Coated Retriever is very quiet and well-mannered. It is very devoted to its owners and great companions for adults and children. This is definitely a top pick for a family dog. If the dog does not get adequate exercise, then may misbehave due to overwhelming, unspent energy. 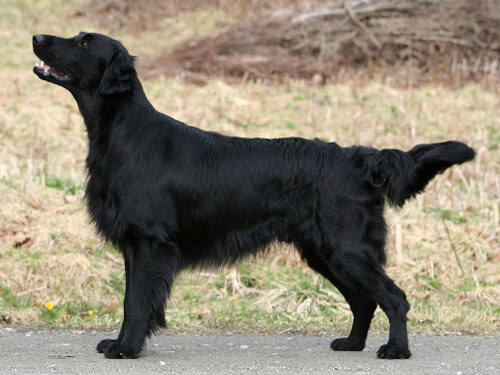 A Flat Coated Retriever’s tail can always be found wagging with excitement. Flat Coated Retrievers need plenty of exercise on a daily basis. One of their favorite activities, one in which they prevail, is retrieving. The breed is known for their intense retrieval skills. If you are considering adopting one of these playful pups, you should understand that you will need to ensure this dog is exercised at least one hour per day. If this breed does not get enough exercise, they can become very disobedient when indoors. As for their coat, their hair grows fairly long, but once it reaches a certain length, the growing ceases. This causes the owner to only trim the dog’s coat only occasionally. As for keeping their tresses knot-free, they only require to be brushed about once a week. Chronic Hip Dysplasia is a condition that strikes Flat Coated Retrievers, along with many other types of retrievers. This is caused when the dog’s ball-in-socket joint because loose and pains the dog when they walk. You can usually see symptoms by watching your dog walk, get up, and climb steps. If they appear to have issues, you should take your dog to your vet immediately to prevent further pain or damage. Glaucoma also strikes this breed more so than other breeds. If your dog shows any symptoms of eye irritation, your vet should be notified so it can get checked out. Diabetes and seizures are also known to attack the breed. The best prevention method an owner can implement is getting their dog tested yearly for hip, eye and knee issues. Initially, Flat Coated Receivers were used to help fisherman hunt and retrieve fish and other objects from lakes, ponds, rivers, oceans, etc. Cod fish was their specialty in the 19th century. As firearms became more popular, hunters began to shoot their prey as opposed to catching it or having their dogs catch it. However, the flat-coated retriever was still needed to point out the shot bird and bring it to their owner. No other breed could compete with this breed’s swimming and retrieving skills. They began to be bred with English Setters and Pointers which eventually ended up producing the wavy-coated retriever. This breed was one of the first to be displayed at English dog shows. The breed was officially recognized by the AKC in 1915 but with plummeting popularity, the breed almost became extinct after World War II. When this was realized, it was a valiant effort by society to consciously try to bring this breed back and eventually succeeded.